Take cooking outdoors this summer back to simpler origins - skip the gas, skip the oven and do all your grilling on an open flame. 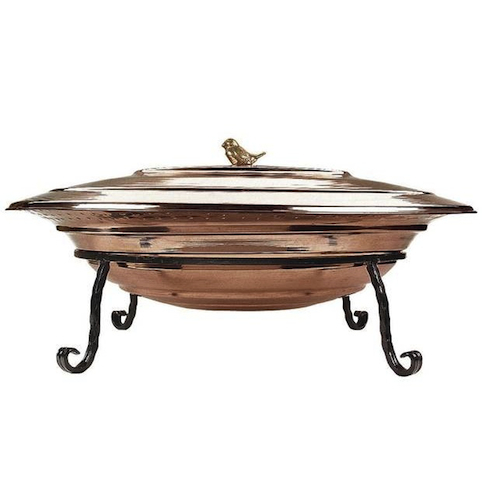 This traditional Turkish grill measures 29" in diameter; as big as a small stove top with room for pots, pans and all the meats and sausages imaginable. It is handmade from recycled copper and wrought iron that is hand spun - because of this each bowl is unique and will age to an attractive darker patina. It is light enough to be portable, for backyard, cabin or beach cooking - doubling as a fire pit when the grill is not in use. Works equally well off wood or charcoal. Lid, charcoal rack and stainless steel grill included.